I have a couple of questions on my Storage. If I go to SYSTEM SETTINGS -----> Storage and view my storage stats, I see a couple for things on my internal storage. 4GB of miscellaneous files and 6GB of audio files. If I click on the miscellaneous files, I have an option to "select all" and delete. Question 1. If I do that to the miscellaneous files, do I run the risk of doing something nasty to my phone's OS or functioning? Will I delete critical files or something else real dumb? Question 2: Does anyone have an idea about the best way to cleanup the Audio files on my internal storage? When I open them with the default music player and select the folder view, it shows pretty much all the content is music files and it even shows the path as being on my external sd card, begging the question: Why are they taking up 6gb of internal storage. Wondering if the default music player is copying my music someplace internally? I do not have the option to delete them through that interface. Anyone know where they might be stored so I can seek and destroy? I have all my apps installed on Internal storage by default but all my music and pics are stored on my external SD card. My internal storage is 16GB with only 5 free. I've done a lot of deleting of unused apps and etc and I don't seem to have a ton of apps or movies and etc hanging around. External SD card has 30GB and I still have 19 left so that's all good. I have also cleared the system cache, pulled the SD card and the numbers remain the same. Ok, so either unmounting the ext SD card or clearing the system cache seems to have cleaned up my audio files, but I'm still wondering what is taking up so much Misc space? 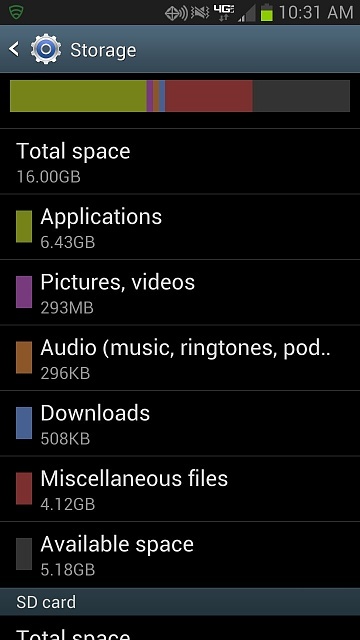 Anyone have any ideas if this is normal for a 16gb Galaxy S3? The misc files show over 4gb, but I can only select and delete a fraction of them. Sent from my Galaxy S3 using Tapatalk. The Miscellaneous category is mostly the OS - you can't delete that. Yeah... probably time for some spring cleaning. I'm about due. thanks for the responses to both of you. Just as a follow up in case it helps others. 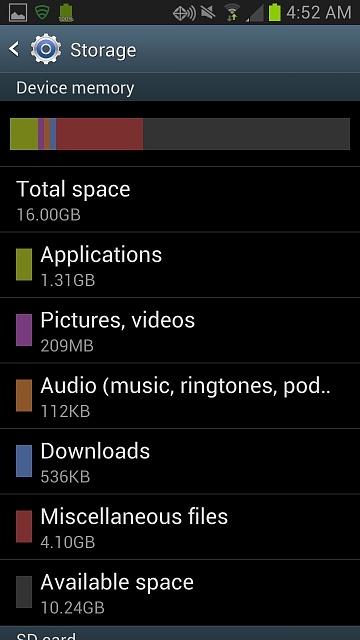 Did a factory reset I got a lot of space back. Not misc files like I suspected but applications. Even after deleting unused apps, that number didn't go down much. Here's what I look like after the factory reset and reinstalling my apps. Yeah, I also did a Factory Reset just to check my information, and before installing any apps/updates this is what it looked like. And the other benefit.... My battery life absolutely Rocks! After a year and a half of downloading, installing, and uninstalling, I didn't realize my battery life was declining. A little spring cleaning brought it back.